As the NHL conference semifinal series begin, there are seven former Terriers on teams still in contention for the Stanley Cup, and four will be playing the Boston-Columbus conference semifinal: Bruins—Charlie Coyle, Matt Grzelcyk and Charlie McAvoy; Blue Jackets—Adam Clendening. The Avalanche, with Colin Wilson, Matt Nieto and AJ Greer will face San Jose. 2019 recruit Robert Mastrosimione scored a pair of goals and added an assist at Chicago defeated Cedar Rapids, 4-1, to close out its Eastern Conference semifinals series. The Steel will meet Muskegon in the conference finals. Mastrosimone, who had 60 points in 54 regular season games, was named All-USHL Third Team, earlier in the week. 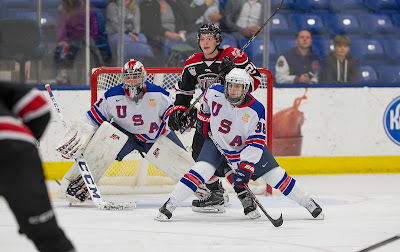 2019 recruit Trevor Zegras returned to the Team USA line-up and assisted on three goals in the final two preliminary round games at the IIHF World U18 Championships in Sweden. Defensemen Case McCarthy (1G,2A) and Domenick Fensore (3A) each have three points for Team USA, which takes on defending champion Finland today in the quarterfinals. Draft Dynasty posted a 2018-19 highlight reel for Zegras, who was ranked #6 among N. Americans by NHL Central Scouting. Prospect Pipeline has ranked 2022 recruit Devin Kaplan as one of the 25 top prospects for the 2020 OHL Priority Draft, calling the 6-2 power forward “a dynamic offensive player who knows how to use his size to his advantage.” The 15-year-old Kaplan scored 68 points in 44 games for the North Jersey Avalanche 16U, playing up a year. "He came in and really made an impact on our team. [...] It seemed like the more he played, the stronger he got. So I can see his role increasing next year." Kiefer Bellows scored a pair of goals, including the overtime game-winner as Bridgeport defeated Hershey 3-2. Chris Bourque assisted on the overtime goal. David Warsofsky scored a goal and AJ Greer assisted on both Colorado Eagle goals in a 3-2loss to Bakersfield. Matt O’Connor, who spent most of the season with ECHL Wheeling, was called up to the Penguins’ AHL team in Wilkes Barre/Scranton, producing a 2.26 GAA and a .930 save percentage. He stopped 31 of 33 shots in the team’s final game. The Bruins' first goal in Wednesday’s 6-4 win against Toronto was the first-ever All-BU goal in an NHL game with Charlie McAvoy providing the finish after passes from Charlie Coyle and Matt Grzelcyk. After last night's all-@TerrierHockey goal for the Bruins, I've been looking through records to find out instances where three or more Terriers were on the same @NHL team. Assistant Athletic Director Kelley later noted: "You could add the 2016-17 Bruins as well. Grzelcyk and JFK played 2 and 1 regular season games, respectively, before McAvoy joined the team during the playoffs." 2019 recruit Case McCarthy scored a goal in Team USA’s 6-1 win against host Sweden in its first preliminary round game at the IIFH World U18 Championship. Fellow recruit Trevor Zegras is currently out of the line-up, which also includes Domenick Fensore and Alex Vlasic, with an upper body injury. The U.S. faces Slovakia on Friday. Ethan Phillips scored a goal and assisted on two goals—including the overtime game-winner—as Sioux Falls completed a two-game sweep of Sioux City in the USHL playoffs. Phillips who had seven of his team’s 52 shots, has four points in two playoff games. Matt Nieto picked up his third playoff point, an assist in Colorado’s 3-2 overtime win against Calgary. The Avs, who hold a 2-1 series lead, called up AJ Greer from the AHL, but he didn’t dress in the contest. Jack Eichel and Clayton Keller are among the first 17 players selected to play for Team USA in next month’s IIHF World Championships in Slovakia. Doyle Somerby scored a goal and added an assist in the Cleveland Monsters’ 5-1 win against the Toronto Marlies in the Monsters’ regular-season finale. The former Terrier captain has an 8-12-20 scoring line in his second pro season. NHL Central Scouting announced its final rankings for June’s Entry Draft with eight future Terriers ranked. The group is led by NTDP U18 standout Trevor Zegras ranked #6 among North American skaters. Also ranked: Alex Vlasic (NTDP) #38; Braden Doyle (Lawrence Academy) #40; Robert Mastrosimone (Chicago Steel) #53; Domenick Fensore (photo, NTDP) #68; Case McCarthy (NTDP) #77; Ethan Phillips (Sioux Falls Stampede) #78; and Cade Webber (The Rivers School) #87. All but Doyle and Webber are 2019 BU recruits. In addition, 2019 recruit Liam Gorman (St. Sebastian’s) was a sixth-round pick of Pittsburgh in the 2018 draft. For the second time in a week, BU has a new commitment for its 2022 recruit class. Nick Roukounakis is a 6’1”, 205 lb. power forward from Pembroke, Mass. A freshman at Thayer Academy playing for former Terrier standout Tony Amonte, he scored 15 points in 19 games, and saw frequent time at the point on the Tigers’ top power play. Roukounakis, who earned an invitation to last month’s USA Hockey NTDP Evaluation Camp, played in the 2017-18 World Selects Invitational, as did 2021 recruits Jeremy Wilmer and Tyler Boucher and 2022 recruit Ryan Greene. He also played midget hockey for Boston Jr. Eagles 16U Elite last fall and recently was selected by Islanders HC in the NCDC Futures draft. 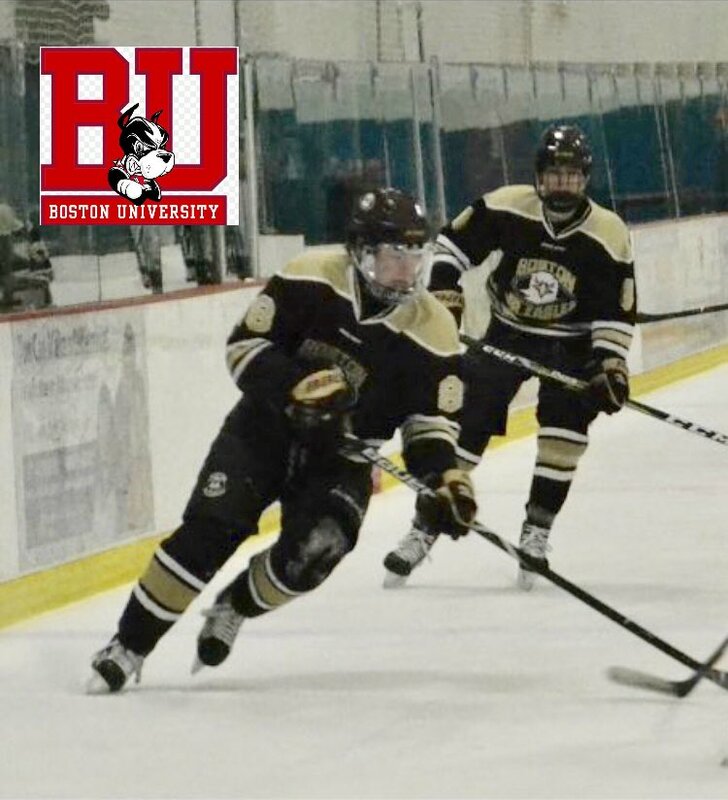 Earlier in the week, BU had received a 2022 commitment from Selects Academy forward Ryan Greene, who scored 81 points in 50 games this season. 4⭐️Ryan Greene to BU. Heads up playmaker. Quick to pucks w/frame to protect High compete w/the ability to score. Nifty & quick in space. Late 2003 had high grades at World Selects & Canada Winter Games. 2019 recruit Phillips leads the Sioux Falls Stampede in points per game with .86. He has 43 points in 50 games. Joined the Stampede full-time in December after beginning the season with Selects Academy. SF begins its playoffs tonight against Sioux City. Make that two short-handed goals in two playoff games for Matt Nieto! Matt Nieto scored his second shorthanded goal in two games in Colorado’s 6-2 game 3 win over Calgary. Nieto added an assist as did Colin Wilson in a contest that saw Hobey Baker Award winnerCale Makar score in his pro debut and the Avs take a 2-1 series lead. Dante Fabbro assisted on the game-winner in Nashville’s 3-2 game 3 win over Dallas. Nick Bonino also had an assist as the Predators took a 2-1 series lead. Charlie Coyle scored a power play goal, assisted by Matt Grzelcyk in the Bruins’ 3-2 loss to Toronto in game 3 of their playoff series. Former Terrier defenseman Pat Aufiero will be inducted into the Winchester Sports Foundation Hall of Fame on May 8. A three-time Boston Globe All-Scholastic defenseman at Winchester High School, he spent his senior year with USA Hockey’s NTDP U18s before joining the Terriers. 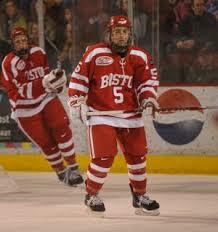 At BU, he earned second team All Hockey East and first team All-New England as a sophomore, finishing his Terrier career with 55 points. Aufiero played for Team USA in the 2000 World Juniors and spent six seasons as a professional. Sophomore Jesse Compher won a gold medal with Team US in the 2019 IIHF Women’s World Championship, becoming the first US-born Terrier to win gold. Previously Marie-Philip Poulin and Jenn Wakefield won gold skating for Canada.